History proves . . . that a smart central bank can protect the economy and the financial sector from the nastier side effects of a stock market collapse. Ben Shalom Bernanke (born December 13, 1953) is an American economist at the Brookings Institution who served two terms as chairman of the Federal Reserve, the central bank of the United States from 2006 to 2014. 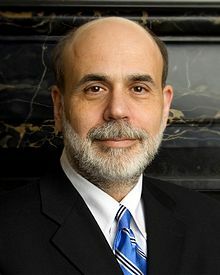 During his tenure as chairman, Bernanke oversaw the Federal Reserve's response to the late-2000s financial crisis. Before becoming Federal Reserve chairman, Bernanke was a tenured professor at Princeton University and chaired the department of economics there from 1996 to September 2002, when he went on public service leave. There’s no denying that a collapse in stock prices today would pose serious macroeconomic challenges for the United States. Consumer spending would slow, and the U.S. economy would become less of a magnet for foreign investors. Economic growth, which in any case has recently been at unsustainable levels, would decline somewhat. History proves, however, that a smart central bank can protect the economy and the financial sector from the nastier side effects of a stock market collapse. Let me end my talk by abusing slightly my status as an official representative of the Federal Reserve System. I would like to say to Milton and Anna: Regarding the Great Depression. You're right, we did it. We're very sorry. But thanks to you, we won't do it again. October 20, 2005, in testimony to Congress's Joint Economic Committee. Speech given on Apr. 7, 2010 to the Dallas Regional Chamber of Commerce, "Economic Challenges: Past, Present and Future". (See pages 13-14 of the speech transcript). Economics is a highly sophisticated field of thought that is superb at explaining to policymakers precisely why the choices they made in the past were wrong. About the future, not so much. However, careful economic analysis does have one important benefit, which is that it can help kill ideas that are completely logically inconsistent or wildly at variance with the data. This insight covers at least 90 percent of proposed economic policies. The Ten Suggestions. Speech given at Baccalaureate Ceremony at Princeton University, Princeton, New Jersey, June 2, 2013. It was a global depression, had many causes, the whole story requires you to look at the whole international system. But policy errors in United States, as well as abroad, did play an important role. And in particular as I said, the Federal Reserve failed in this first challenge in both parts of its mission. It did not use monetary policy aggressively to prevent deflation and the collapse in the economy, so it failed in its economic stability function. And it didn't adequately perform its function as lender of last resort allowing many bank failures and a resulting contraction in credit and also with the money supply. So, in that respect, again, the Fed did not fulfill its intended mission. I want to make sure you keep your eyes on the ball, that is, the two basic missions of a central bank. The first is maintaining macroeconomic stability: maintaining stable growth and keeping inflation low and stable. The principal policy tool for maintaining macroeconomic stability is monetary policy. In normal times, the Fed and other central banks use open market operations—purchases and sales of securities in markets—to move interest rates up or down, and in doing so try to create a more stable macroeconomic environment. The second part of a central bank's mission is maintaining financial stability. Central banks are focused on trying to ensure that the financial system functions properly, and in particular, they want to prevent, if possible, and if not, to mitigate the effects of a financial crisis or a financial panic. We did stop the meltdown. We avoided what would have been, I think, a collapse of the global financial system. That was obviously a good thing. But one thing that I was always sure of and the Federal Reserve was always sure of was that a collapse of some of these big financial firms was going to have very serious collateral consequences. There were people arguing even as late as September 2008, “Well, why don't you just let the firms collapse? There is a system that can take care of it: bankruptcy. Why don't you let them fail?” We never thought that was a good option. Particularly, if the whole system had collapsed, we would have had extraordinarily serious consequences. Obviously, based on the crisis and what happened and the effects that we're still feeling, it's now clear that maintaining financial stability is just as an important a responsibility as monetary and economic stability. And indeed, this is, you know, very much a return to the—where the Fed came from in the beginning. Remember the reason that Fed was created was to try to reduce the incidents of financial panics, so financial stability was the original goal of creation of the Fed. So now we sort of come full circle. This page was last edited on 16 April 2019, at 14:11.